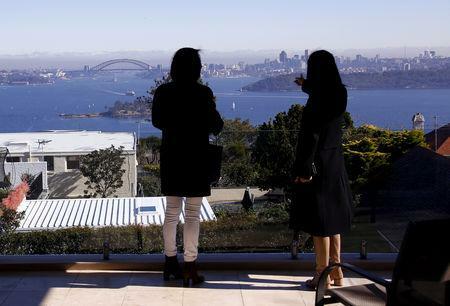 SYDNEY (Reuters) - Australia on Wednesday cut its annual intake of immigrants by nearly 15 percent, and barred some new arrivals from living in its largest cities for three years, in a bid to ease urban congestion. Prime Minister Scott Morrison - who is trailing badly in the polls ahead of a federal election in May - hopes to tap into rising voter frustration over house prices and congestion, which some see as a consequence of population growth. "This is a practical problem that Australians wanted addressed," Morrison told reporters in Canberra, the capital, after announcing the annual immigration intake would be cut to 160,000 people, with effect from July 1, versus 190,000 before. The policy change comes at a time of national reflection over Australia's attitude towards migrants after the shooting of at least 50 people at two mosques in New Zealand's city of Christchurch. Australian Brenton Tarrant, 28, a suspected white supremacist, was charged with murder on Saturday after a lone gunman opened fire at the two mosques during Friday prayers. "My great frustration is that, in addressing these issues of population and immigration programs, these debates often get hijacked by those of competing views who seek to exploit them for other causes," Morrison added. "I reject all of that absolutely." A ReachTel poll published in September showed that 63 percent of Sydney residents supported curbs on the number of migrants moving to Australia's biggest city. Morrison said the cap would include places for up to 23,000 people who could migrate to Australia under a new skilled visa. Such arrivals could gain permanent residency after living outside of Australia's largest cities for three years, he added. They will be barred from living in Melbourne, Perth, Sydney or the Gold Coast, where infrastructure is overutilised, said immigration minister David Coleman. Authorities will require proof of residential and work addresses in future applications for permanent residency, he added, as a way of enforcing the requirement. Business welcomed the bid to alleviate regional skill shortages. "While Australians in our major cities are frustrated by congestion, those in our regions have told us they need more people, skills, jobs and investment," said Jennifer Westacott, chief executive of the Australian Business Council. There is no cap on temporary migration, such as students on temporary visas, who form the bulk of migrants to Australia, which issued 378,292 student visas in the year to June 30, 2018.